Check Out The Indian Head Massage! The Indian head massage is a popular alternative medicine massage therapy. Focus is placed on the client’s head, face and neck. The underlying principle is that there are energy channels within the area above the shoulders that impact the function of every organ in the human body. By using massage techniques to free those channels of any blocks that prevent the free flow of energy throughout the body, it is believed that a balance of body and mind can be restored. As a result, the individual begins to heal from whatever ailment has been troubling him or her. Originating in India, this technique was introduced to North America in the early 1970’s. 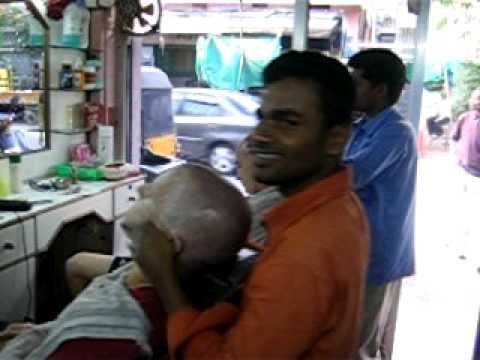 Check out footage of the Indian head massage technique at Ganesh’s Male Saloon in Hyderabad, India. That barber’s (orange shirt) “smizing” would make Tyra proud! I’d fall alseep! Take me to India now lol. THIS LOOKS LIKE IT FEELS SO GOOD!